INFOGRAPHIC: Solar Terms You Should Know | West Coast Solar, Inc. The conversion of light energy into usable electricity. A photovoltaic system uses solar panels (modules) made up of cells to generate electric power. The percentage of solar energy that reaches a module (solar panel) that is then converted into electrical power. An estimate of how long it will take for you to break even on your investment. A solar system that is connected to the grid so it can send excess power there for later use. The device that converts direct current (DC) power from your solar system into alternating current (AC) power that your home can then use. Sending excess electricity back through the electricity meter to the utility company, helping you reduce your bill or even make money from your solar installation. 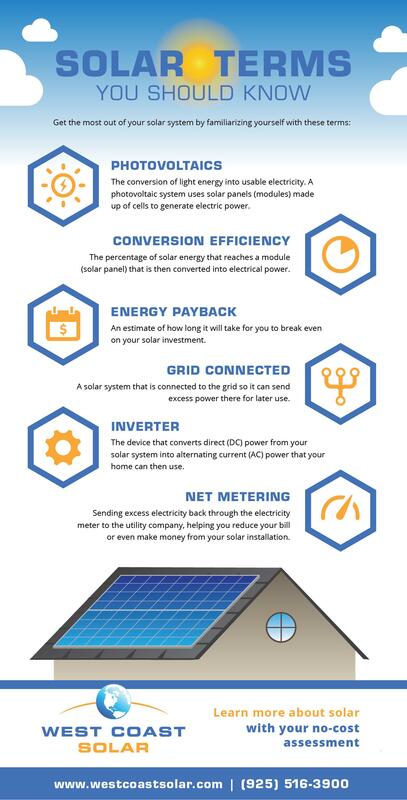 Learn more about solar with your no-cost assessment.